In November, we celebrate National Home Care and Family Caregivers Month, observances that are central to FirstLight Home Care. Throughout the month, our FirstLight weekly blog will focus on providing the tools, tips, resources and peace of mind that so many family caregivers need. If you are or have been a family caregiver, we invite you to comment and share your rewarding experiences caring for a loved one, as well as the struggles you have faced throughout your caregiving journey. Providing care for an aging loved one can be rewarding. But it can also be quite difficult. If you’re a first-time caregiver, it can be even tougher, because not only is the role of family caregiver demanding and stressful, but it can cause hesitation, doubt and rattle your confidence if you’re not sure where to begin. Sometimes you are thrust into a situation you’re not prepared for. 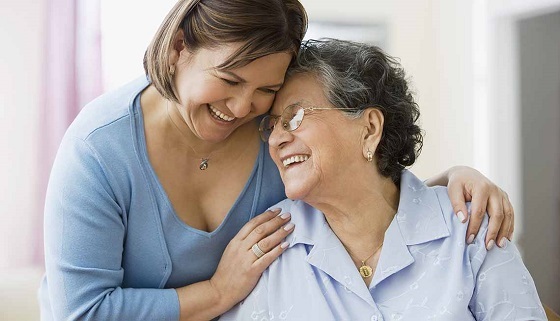 If you’ve recently begun caring for a parent, grandparent or another family member, and the caregiving responsibilities are all new to you, the following tips may help as you prepare to take on your new role as a first-time caregiver. 1. Know what you are facing. Although you may immediately feel that it’s your sole responsibility to become the primary caregiver to your family member, there are several things to consider before you decide to take on the role. As a first-time caregiver, you will need to keep track of a significant amount of information, and the daily schedule you once knew could dramatically change. Your loved one will need to get to and from doctor appointments. You will need to keep track of their medications and pick up prescriptions. And this is in addition to the other many aspects of caregiving, including grocery shopping, meal planning, laundry and more. Technology can be your ally. There are a number of caregiving apps that can help you maintain important information about your loved one, receive appointment and medication reminders, take notes and coordinate schedules if you have multiple family members and/or professional caregivers assisting with care. Additionally, if you are not familiar with your loved one’s condition, learn as much as you can so that you can not only provide the best care now, but you also know what to expect as their condition progresses. This will help you make informed decisions about care options as your loved one ages. 2. Involve your loved one. Ask your loved one what they want. Make sure they are part of the conversation when it comes to important decisions, such as their finances, living situation and overall health. Most seniors struggle with the fact that they need help with the everyday tasks they used to do on their own. Having a caregiver can make them feel like they’ve lost their independence. When possible, encourage independence. Involve them in decisions about their care. If it’s safe, allow them to perform some of their daily tasks on their own so that they feel less dependent on you. Create a system of family and friends who can assist with caregiving responsibilities, even if they help with minor tasks such as laundry, grocery shopping and meal preparation. Consider hiring a professional caregiver to come in for a few hours a week to assist with respite care for you and companion care or personal care needs for your senior. Find a community of caregivers. FirstLight’s resident nurse and Director of Client Care Services, Rebecca Rushing, gives this advice: Joining a caregiver support group allows you to be with those who really understand because they’ve been there too. Support groups encourage you to share common experiences and discuss some of the difficult and challenging situations you may be facing. One thing many caregivers tend to neglect is their own health and well-being. A support group can provide validation and encouragement that it’s OK to take care of yourself. Take a break every so often, seek respite and make sure you get enough rest. This will make you a better caregiver in the long run. 4. Be mindful of the potential costs of caregiving. Family caregivers give a lot of themselves, and they do not get paid. In fact, according to a recent AARP study, family caregivers spend an average of nearly $7,000 on out-of-pocket costs related to caregiving – almost 20 percent of their annual income. On average, caregivers spend a little more than 24 hours per week providing care to their loved one, and 25 percent of those caregivers devote 41 or more hours of care per week. If you also have a paying job, that job can suffer. Many family caregivers make work accommodations due to family caregiving responsibilities, including taking a leave of absence, arriving late, passing up a promotion or retiring early. 5. Take care of you. Would you recognize the warning signs of caregiver burnout? According to the Cleveland Clinic, caregiver burnout is a state of physical, emotional, and mental exhaustion that may be accompanied by a change in attitude. Burnout can occur when family caregivers don’t get the help they need, or if they try to take on more than they are able. If you are a first-time caregiver, you may not experience burnout right away. But you should take immediate steps to try and prevent it altogether. Take care of you and you can take better care of your loved one. Get adequate sleep, eat well, take the time to do something you enjoy and socialize with friends – even if that means bringing in outside help to provide respite care. If you are new to caregiving, you may be worried about many things and also feel overwhelmed by everything you are taking on. But with a little time, patience and help from others, you will be the best family caregiver to your loved one. Are you a first-time caregiver? What advice would you give others who are new to this role?